The racing season started for me this past Saturday with the 2011 Poor College Kids Road Race. This was my first competitive event and I was not alone judging by the number of entrants in my category, the Women's Cat 4. Combined with the Women's Cat 3, the field nearly doubled from the 35+ women who finished last year. I didn't do as well as I had hoped (unfounded expectations for someone with no racing experience lol...) but in the end I had a great time and learned some valuable lessons from the event. When John and I arrived early at the race location near Los Olivos the sun had yet to rise and it was pretty cold--the temperature was around 47 degrees. Parking was in the field of wild damp grass and soft dirt which made it challenging to get to/from the road and car but we worked out the logistics by walking in sneakers and carrying our bikes and riding shoes. We would've gunked up our cleats and risked embedding thorns in our tires otherwise. So bring extra socks and shoes you don't mind getting muddy or park along the road as others have done (we wanted to avoid opening the car doors on the cramped stretch of road on which there was traffic of cyclists and cars). After signing in and getting my race numbers, John pinned them on my jersey and made our water bottles while I warmed up on the trainer (it probably would have been better to warm up by riding on the road and hit the start line without having to dismount from the trainer and have my legs get cold). When the Men's Cat 5A and 5B took off from the start line, my teammate Melinda and I lined up with our friends Kaelin and Ashley along the side of the road and waited for our turn to start at 8:10 a.m. Other women on our team couldn't make it to the race due to illness or family emergency. John and I almost canceled our trip when he caught some bug late in the week; I was mildly affected. I tried to lessen the intimidation of starting with the large pack of about 65 women by thinking of the 34 mile course as a 'group ride'. Little did I know the mindset would be taken literally. The course began on the narrow Zaca Station Road. It was shaky start at roll out as I weaved around people trying to get on their bike or clip in to their pedals. It may have been a good idea to wait as close to the start line if possible to avoid getting stuck behind the shuffle and set the pace. Towards the middle where I was at, the movement was stop-and-go before we could settle in to our saddles. Around me women were riding staggered instead of picking a line, meandering across the road or swerving to avoid potholes. At times we would get going and then come to a screeching halt--for no apparent reason. Kid you not when I say women were calling out, "Slowing!" and "Stopping" around us, which is typical for a group ride. After a while I found myself verbalizing hazards through gritted teeth and anticipating a bump from someone behind me. The air was clouded in mist so I am sure the decreased visibility was disorienting, even for those familiar with the road. No doubt the cause of this was due to nervous riders sprinting to close a gap and then slowing down abruptly to avoid hitting the wheel in front of them which in turn causes a rippling effect behind them like a yo-yo or rubber band expanding and contracting. Experienced riders know how to smooth this out by pedaling a little faster or coasting to slow down and if necessary feathering the breaks but I guess it all this is part of racing and the mingling of a mixed group of riders. The reality: it's a race and not an organized group ride. It was very frustrating for me to be in the middle of the shuffling. I wanted to shotgun to the front of the pack where the group rode more steadily but the last thing I wanted to do was cause a crash by trying to squeeze by. To the left was the center line of the road which was strictly enforced and we would be disqualified for crossing it to pass. There was no shoulder to the right, just dirt and grass along the tight road. Then I made the mistake of dropping back thinking I would have more room to avoid dodging wheels but it left me without shelter from the wind resistance. There I wasted energy struggling to find my place in the pack and a steady wheel to draft while we were slowing climbing onto Foxen Canyon. It was harder and harder for me to stay with the group. Had I kept focus and felt my best I may have hung on but I gave in too soon before the pace let up. As Phil Liggett would say, "The elastic has snapped." And that's what I did--I popped off the back and watched the peloton ride on down the road while I tried to catch my breath. After that I rode alone descending from Fox Canyon to the windy flat roads of the Santa Ynez Valley catching and passing a few others who had also fallen off the back of the bunch. I drafted a couple riders for relief and then I offered to pull. We formed a paceline switching off when one got tired and gained momentum. As we passed other women we offered our wheel and they joined our train. Meanwhile the main group looped back with Melinda among them. I cheered her on smiling for the first time since the race started. Seventeen miles from the start line, we turned around in front of a winery and came back up the false flat. I knew we would never catch the pack, especially at the pace we were riding so I sat in. I would rather stay with our group and enjoy their company than ride alone. Now I was just pedaling to complete the race. 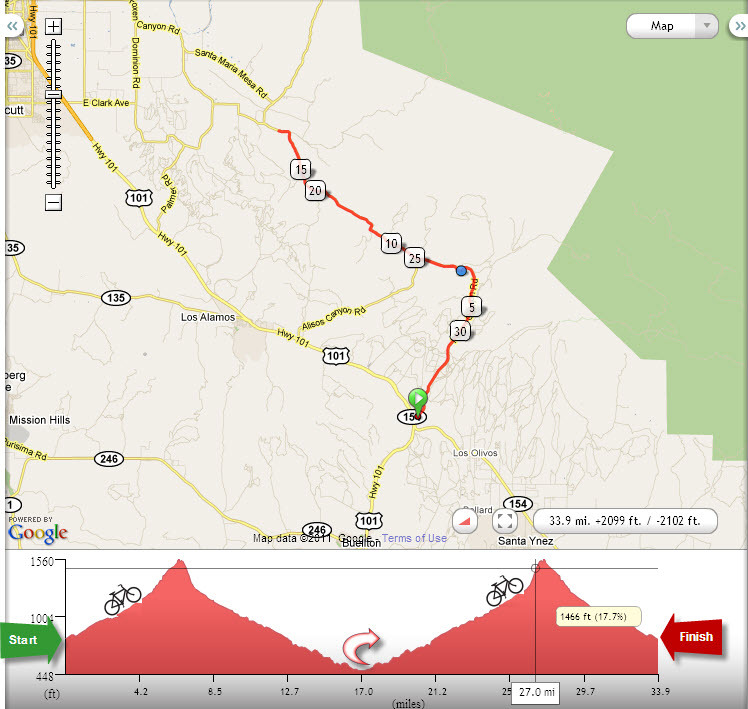 There's a steep climb back up Foxen Canyon around mile 27 before descending the last few miles to the finish line. I give myself a pat on the back for persevering up the hill with two others. The rest in my group fell behind. We flew through the remaining miles and caught one person who I was behind when we crossed the finish line. At this point I didn't bother sprinting to try and gain one more place. What difference would it make? What mattered is I raced, I finished and did so without crashing, getting a flat, or a mechanical mishap which have unfortunately befallen a couple of my fellow riders. I had friends and teammates with me who gave me much needed encouragement and hugs--I love you guys!! One of the best times was talking about the race and hanging with everyone afterward. While on and off the bike, I met other women with whom I had raced with. In the end, the day was quite an adventure--I am so glad to have embarked on. I have to remember that it is early in the season and there is so many more races to come. Until then I will keep on pedaling and continue to train hard! I didn't realize it was so difficult to ride a race like that. Great review, and great job on your first race. All you will do is improve now baby! I am soooooo proud of you!!! @Joe: I think anyone can certainly get in there and pedal along in the race. There are best practices and tactics if someone wants a chance at winning a place on the podium. @Johnny: Thank you :-) I should be proud of myself for attempting a race and finishing. Congratulations Daly! I think you did great, so much to be proud of! I am going to be so nervous for my first race. I'm hoping that I will be well enough for VOS, but I'm going to try not to expect much for the first time and still getting over this sickness. Hope you are doing well! Thanks Kristen! I also hope you feel well enough for Valley of the Sun. I will be thinking of you and your first race. We would love to do it but it's a logistical nightmare with each stage 50-60 miles from the center point where we would be staying. I wish you all the best!! !